The most elegant of columns, stone columns not only give your porch a natural look but they also add immense curb appeal. Stones must be cut from large slabs which substantially increases the overall costs; however, the final look is a work of art. 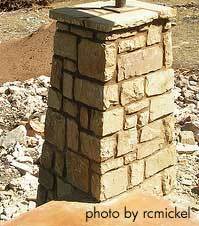 Size: Consider both the size of the columns and the size of stone you will use. Both are important. 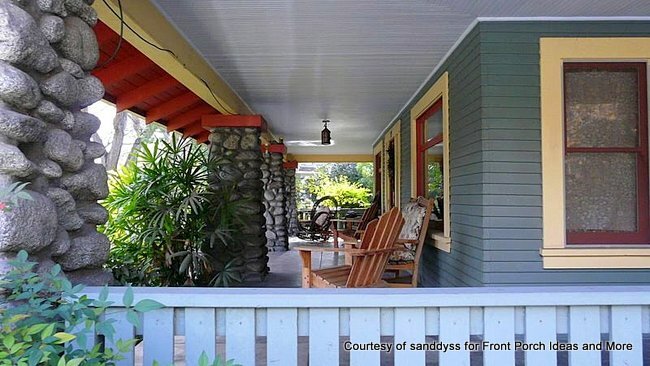 When selecting or building front porch columns, you want them to be aesthetically pleasing and proportional to your porch. You also want to ensure they are not so large as to impact your view. 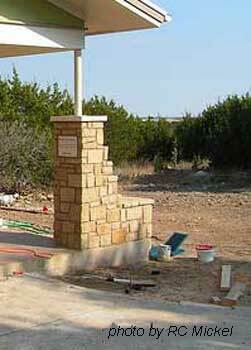 In addition, choose a stone size that is proportional to the overall size of your column. Color: Stones come in a wide variety of colors. Choose contrasting or bolder colors if you want your columns to stand out and be even more prominent. Choose complementary colors if you want them to blend in with your porch's color or if you want to make a more subtle statement. Pattern: Like colors, patterns also vary and can have a dramatic effect on your overall look. 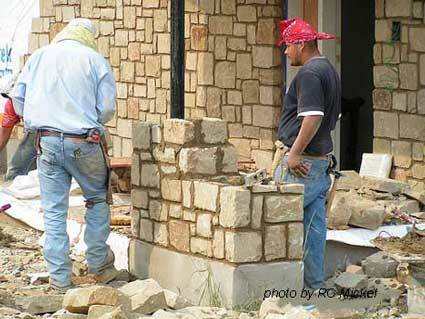 Many patterns are dependent on the cut and type of stone chosen. 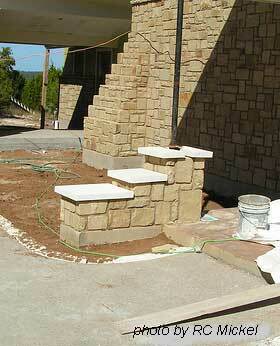 So consider the effect the overall pattern the stone you select will have visually on your porch. 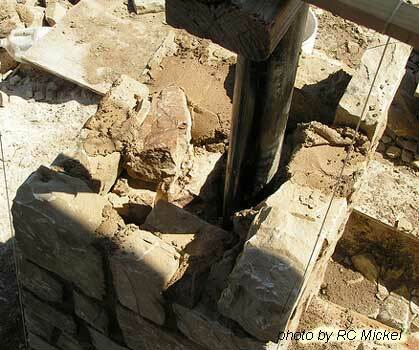 The following pictures depict an almost step-by-step construction of stone front porch columns to surround steel posts which in turn hold the porch roof. 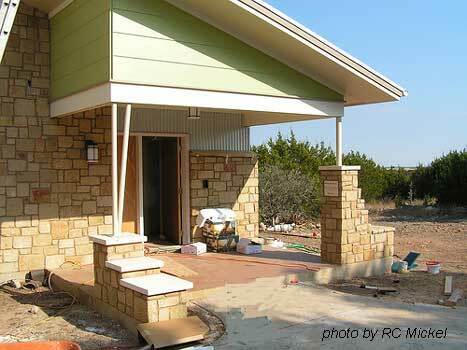 The stone used was natural Texas sandstone from the Kirby Stone Company in Lometa, Texas. 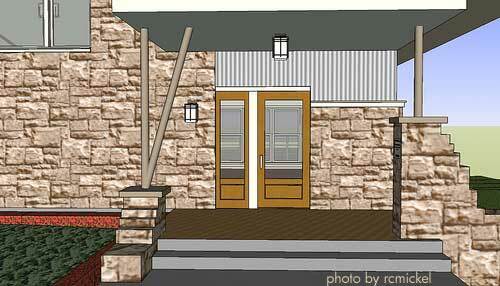 The stone color the owner chose was "Autumn Blend Combination" but he requested more tan and brown than red/orange. 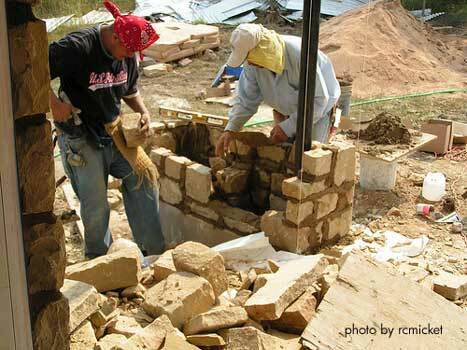 The stone was delivered in 6, 8, 10, 12 and 14 inch blocks (some rectangular, some square). 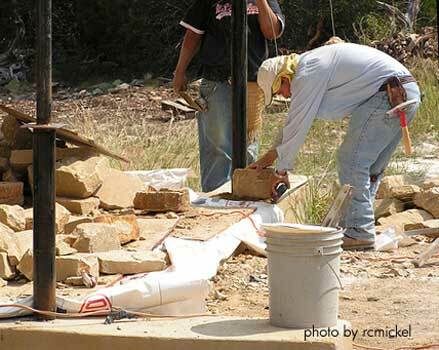 The stone masons chipped and cut the stones to fit at the job site. 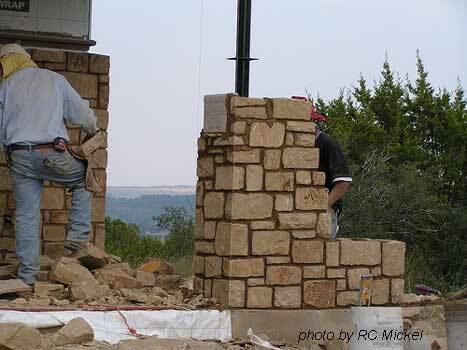 The columns will be finished with limestone caps. 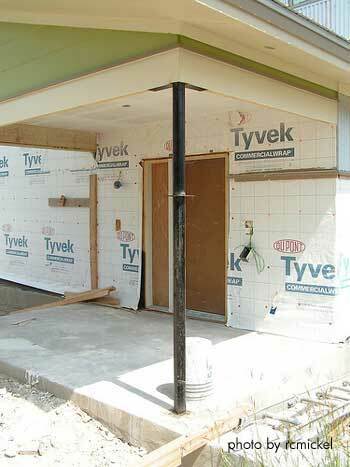 The following 3 pictures depict the "conceptual" drawings of the front porch and the steel support column. 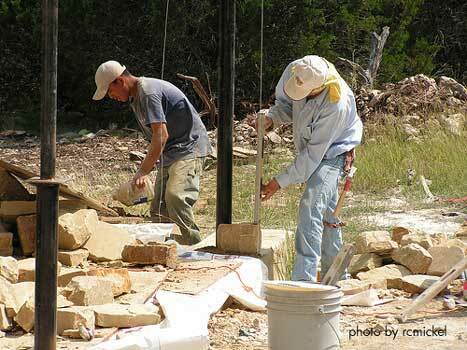 The first stones are being laid and squared. 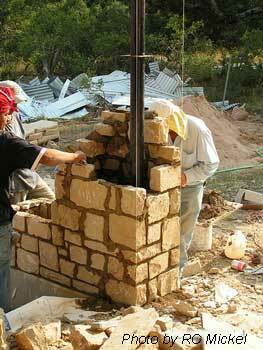 Column is beginning to take shape. Care is taken to ensure proper alignment. 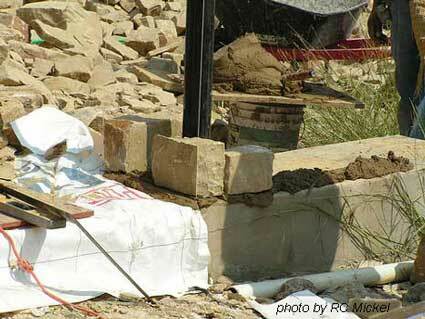 Again our sincere thanks to RC Mickel for sharing his pictures and story with us.